Don’t you just love visiting Farmer’s markets? I’m a recent fan. Especially for the ones right here in our own town. This year, starting over Memorial Day Weekend, there were three in Andes! And I made a very unexpected find I can’t wait to tell you about. You can probably guess from the title, but just in case I wasn’t obvious enough, sometime between visiting the brand new FoodWorks+, at the old Andel Inn, to drop off my mother’s fresh rhubarb, and treading past downtown by the Tin Horn and the Two Old Tarts, we parked across from the school to visit the Dirty Girl Farm. There were delicious cider drinks from Fantasy Fruit Farm, savory sausages by Full Moon Farm, fresh chard, kale and radishes from Berry Brook Farm, plus more delicious pasteurized goat milk and soft cheese from the Dirty Girl. You could even visit baby goats. But like a bear to honey, I had to stop and chat with the beekeepers. Plus Pam West-Finkle has taught me a few Librarian tricks to boot. At the library there is a fondness for tea with honey. Hillside Honey is based near Gladstone Hollow and their hives serve as super-pollinators for our town’s hills and valleys. Honeybees will travel four miles from their hive – so if you’ve been anywhere in historic downtown you’re probably acquainted with their bees. In fact, what started as a hobby for the Finkles in 2012 has grown into a full-fledged operation with 35 hives, some at the Hillside property and others on New Kingston Road. They collect twice a year, in the Spring and Autumn. Oh, they collect plenty. That must be because we have so many beautiful gardens in town and farms along the gentle slopes and hillsides. Some feel they visit the library often enough to be issued their own library cards! There are so many more benefits to honey — especially locally procured honey — I won’t list them all. 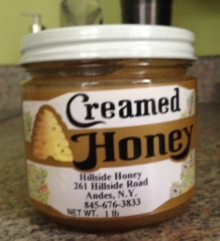 But I will say that Hillside Honey is delicious and makes a great gift. In Andes, you can find their honeys at the Dirty Girl Farmer’s Market every Saturday. You’re also always welcome to meander through town to catch a glimpse of their busy bees at work.